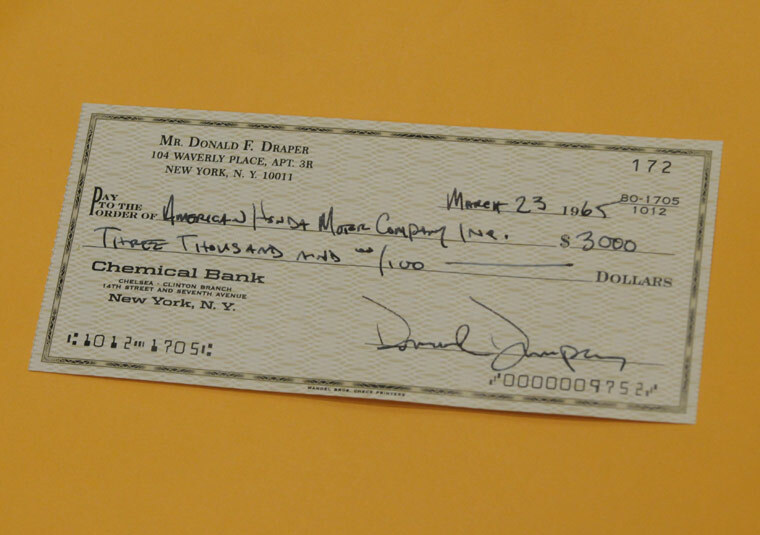 This is the check that Don wrote in the Mad Men episode when Sterling-Cooper-Draper-Pryce dropped out of the Honda RFP. Here's Don's building in case you're wondering. 104 Waverly Place is in Greenwich Village, on the corner of McDougal and Waverly, across the street from Washington Square Park. AMC has a season four scrapbook on their website that's chock full of these sorts of odds and ends that produce paroxysms of glee among Mad Men fans. Check it out. All hail Rufus the Dog from Dog Walk Blog for pointing it out to me.